It is always great to share ideas and experiences with others in your field, and so the meeting of the Digital infrastructure programme – of which our project is part – was enjoyable and very useful. Through our project and my growing general interest, digital archiving techniques are helping me to shape some new approaches to more conventional electronic records management problems. The outcome of Manchester’s Caracanet Case Study, which deals with the acquisition and preservation of email accounts, will be invaluable to records managers trying to define approaches to managing emails as records across their organisations. The Institute of Education’s Digital Directorate project was interesting to me as archivists approaching essentially a records management challenge. The inter-disciplinary approach can surely only benefit both fields. I am a keen advocate of training and awareness and several projects – DICE, PrePARE, SHARD – looked at ways of engaging the producers of research data with preservation issues. I’ll also be very interested in the outcomes of Bristol’s DataSafe project. There are so many methods now of delivering training; these projects should give some useful pointers to what works best and what our target audiences want. The discussions that followed covered the value and benefits of digital preservation and how best to establish a business case for DP projects. I’m still convinced that it will be the hard numbers around reduced storage costs that will give a bedrock to the other DP benefits. The implied processes of appraisal and selection around what groups of records to keep will surely give us the opportunity to get rid of the huge amounts of unstructured information many organisations are storing. There was a debate about the best approaches to ‘community engagement’ around digital preservation, including an account of a previous three day ‘hackathon’ as part of the AQuA project. Whilst I am a big fan of listservs and online forums, this event showed that getting a few people in a room to share their experience is still the best way to build and maintain a ‘community’. 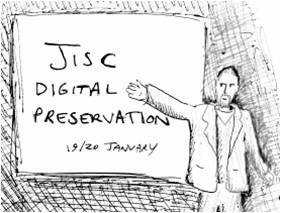 Thanks to JISC and the SPRUCE project for organising and to the attendees for a really enjoyable and useful meeting. This entry was posted in Uncategorized and tagged Community, digital archiving, digital preservation, Meeting on January 23, 2012 by Kit.